s Centre for Social Justice? After Tory MPs passed a vote of no confidence in him and he was forced into resigning as leader he apparently underwent a damascene conversion. He set up him Social Market Foundation and visited Easterhouse, the most infamous of Scottish housing estates in Glasgow. 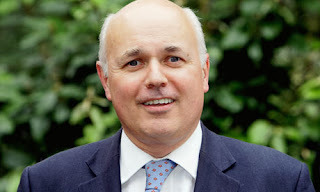 ﻿What IDS has done is to cut benefits to the bone. Housing Benefit for under-25's will soon be gone. The 'granny tax' will and is ensuring new levels of homelessness, massive levels of sanctions are forcing people into starvation. All the while his friends in the City and Utility companies reap the rewards of making the poor pay for their gambling habits. Below is an excellent article from the 'Outrage' Blog. The 'quiet man' of politics has become a spluttering mass of incompetence. His universal credit, aimed at combining 6 benefits and working 'real time' has been so complex that the IT systems couldn't cope and it is way behind schedule, if it ever materialises. But what has the opposition to say? Rachel Reeve the new Shadow Minister for the DWP said New Labour would be tougher than the Tories on welfare recipients, proving that New Labour wouldn't recognise a principle if it bit it on the buttocks. But as Dennis McShameless has proved Miliband's New Labour is corrupt and useless as the Tories. Like his 18th century counterparts Iain Duncan Smith has managed to turn a profit out of the sick, disabled and unemployed, who next OAP? The 18th century would have approved of entrusting the disappearance from sight of the poor, the afflicted, the workless, the seeker of asylum and the criminal, to new superintendents of the poor, including A4E, Capita and Serco. When the powerful invoke "fairness", and represent the privileged as victims of exploitation by the powerless, it is usually the prelude to some spectacular act of injustice towards minorities, the excluded and the poor. The singular achievement of the present government has been to appoint new "overseers of the poor", although it forbears from using this term, which dates from the 16th century, when it designated the administrators and distributors of poor relief. These new overseers are far from the flinty and ignorant officials of the Old Poor Law, as they are – and not for the first time – commercial entities. The poor have often been eyed covetously by enterprise, as they represent an apparently enduring group in society, out of whom it must surely be possible, in one way or another, to make a profit, the word David Cameron has cleansed of any association with dirt – perhaps prematurely, as G4S and Serco demonstrated, when they charged the government for tagging prisoners who did not exist. Atos, tasked with the judgment of whether individuals are fit for employment, finds itself the inheritor of an ancient debate about the "deserving" and "undeserving". The fate of the most vulnerable people – in children's homes, prisons, care homes, rehabilitation centres, adult care homes and probation services – is increasingly in the hands of private providers, just as they were when known as orphans, felons, the lame and the halt, and the aged, who have "borne the heat and burthen of the day". This government's use of private companies – a policy re-affirmed last week by Francis Maude – in the improvement of pauper management has its antecedents in the 18th century, when the task was widely outsourced to willing providers. Far from being an "innovative" approach to poverty, the present government looks deep into a punitive past for inspiration. Perhaps these modern Conservatives hark back to the Poor Law Relief Act of 1723, when local justices of the peace were allowed to contract the administration of relief out to those who would feed, clothe and house the poor. Relief was given according to a prescribed quantity of labour, and was calculated to put an end to the "false and frivolous pretences" under which many people were believed to have found relief. The poor were to be managed by the contractor at so much a head, or maintained for a lump sum agreed in advance. In the first case, it served the contractor to cram as many people into the workhouse as possible; in the second, it was in his interest to keep them out. This was achieved by the payment of pensions that cost less than the paupers' upkeep in the workhouse. The standard inside was so low that people willingly accepted miserable payments as "out-relief". The poor rates duly declined. Everything that could be was contracted out – physicians for medical services, carpenters for making coffins, shifts for living paupers and shrouds for dead ones. Of course, the rhetoric has changed: the oratory of the 18th century has decayed, and is now inflected by a show of caring: we shall not neglect you or abandon you to worklessness, says George Osborne, but his embrace of the excluded is as uncharitable as it ever was, as he also declares that the "something-for-nothing culture" is at an end. The indolent and the workshy, identified during half a millennium of Poor Laws, are impervious to threats and exhortations. Those who suffer will be people whose lives have already been blighted, and many of whom were born to an inheritance, not of "hard-working strivers", but of despair. They are, for the most part, highly vulnerable and, if among them foxy cheats dissimulate themselves, these should not be used to inspire terror in the weak and wounded of society. What useful purpose is served by compelling the injured and humiliated of the world to sign on daily, to clear litter from the streets, to work for charities for nothing? Picking oakum looks, by contrast, like a positively purposeful activity. What triumph lies in compulsion intended for the defeated and the demoralised, the unloved and abused, the frightened and the mentally infirm, the under-endowed and the psychologically damaged (often with invisible handicaps), people immobilised by depression or detached, not from society, but from life itself? It is one thing to boast of hard work and achievement, but in the presence of the shut-ins and the frightened, the twilight world of the addict and the obsessive, these heroics are tainted. This is why it is ignoble to attack those predestined to lose all the rewards and prizes with which the rich and capable have so effortlessly made off.If there is a ghostly quality in the language of today's warriors against the poor, it is because the prescriptions they offer have been tendered at least since the consolidation of the Elizabethan Poor Law of 1601. When Iain Duncan Smith, George Osborne, Frank Field and former archbishops give their prescriptions, it is like being at some cosmic seance, as they are enunciating a wisdom from beyond the grave. In 1798, Jeremy Bentham published Pauper Management Improved. He proposed institutions for regulating the poor and, to facilitate this, he drew up a map of what he called Pauperland. This was an inventory of "that part of the natural livestock which has no feathers and walks on two legs". He meant those who labour. In his opinion, "Not one person in a hundred is incapable of all employment. Not the motion of a finger, not a step, not a wink, not a whisper, but ought to be turned to account in the way of profit." Bentham's cheeseparing scheme for the poor inspired generatio/ns of administrators: he would make hats brimless so as not to waste material; bedcovers would be fastened by clips to save on superfluous fabric. What an inspiration to the tax on those in social housing with a spare room, even if it holds necessary aids that enable disabled people to participate in society. Meanwhile, turning the "wink and the whisper" of the sick to profit is admirably pursued by Atos, which has deemed fit for work people with terminal illness, some of whom have indeed died within days of being declared employable. The 18th century would have approved of entrusting the disappearance from sight of the poor, the afflicted, the workless, the seeker of asylum and the criminal, to new superintendents of the poor, including A4E, Capita and Serco. The charge is not one of parsimony, nor even of the elevation of efficiency over humanity. It is that the richest societies in the world are still ready to impose punitive sanctions upon the least defended. If anthropologists wish to examine life and labour in a savage society, they no longer need seek out rare, uncontacted peoples in the Amazon or Polynesia; all they require is an airline ticket to contemporary Britain.